Mmm Will the Govt fund the next logical step for Hall…buying up bad loans from the likes of Ulster that are not Irish Govt. owned? What universe are we in that Hall and the Irish Govt are now in the business of managing distressed asset sales. I take exception to the mannerless, unprofessional and contemptuous nature of the letter. To be fair to Mr Weston; his grievance was this and not specifically the anti-money laundering regulations. Judge Linnane said Mr and Mrs Gilson were making sporadic payments in very small amounts, sometimes as little as €50, while attempting to come to an arrangement with the bank. Arrears had begun appearing in 2010 and the couple had been written to as early as 2014. It was up for 830k on 30 Jan 2018 with Lloyd Daly. The figure is small in the context of a 750,000-strong Irish mortgage market and in the context of a mortgage arrears problem that affected nearly 100,000 borrowers at its peak in 2013. In a speech to the Institute for International and European Affairs (IIEA) in Dublin, Prof Lane that since the third quarter of 2009, 8,195 private-dwelling homes had been repossessed by banks or other entities. …“Our analysis that house prices have moved broadly in line with fundamentals is fully consistent with a material risk of a reversal in house prices: buying a house is certainly not a one-way bet,” he said . “In particular, international and domestic factors may trigger fundamentals-driven corrections in the housing market,” Prof Lane said. A judge heard all her cases under garda surveillance Thursday after what was taken as a threat against her was posted on Facebook. Judge Jacqueline Linnane was put on notice of the threat just before she was due to sit in the Circuit Civil Court at 10am. The post, in which Thursday was described as “hand grenade day,” was taken seriously by members of the Courts Service who called for a garda presence in Court 22 before Judge Linnane went on the bench. “Tomorrow is hand grenade day: I am so fed up with the Dublin Circuit Court judge, one Ms Linnane, disrespecting The Hub Ireland, any Litigants in person what adhere themselves to us. 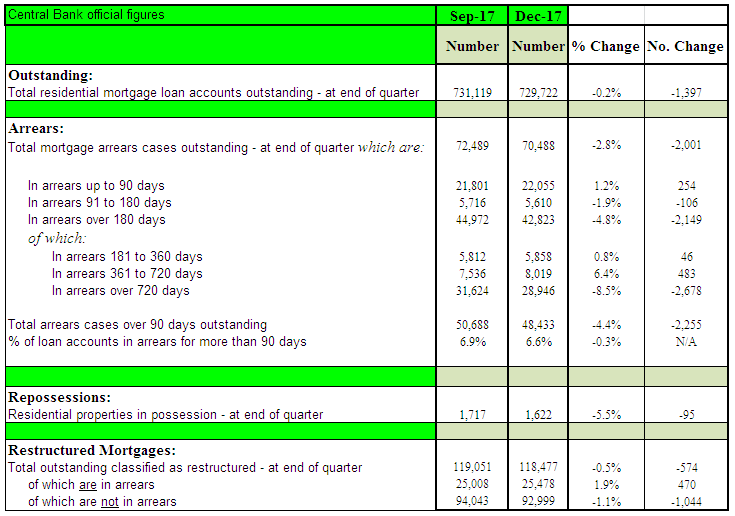 Latest Central Bank Arrears figures are out. Pretty Charts here. The rump of non-performing loans is looking pretty stubborn. Also an interesting post by BB over on AAM with some info on PTSB’s star non-performers. “It takes 32 attempts on average to get a non-engaging customer to take a call”. PTSB before the Dail PAC committee today. How much has strategic defaulting cost the exchequer over the last decade, with more to come. I’m sure it would go a way to building a metro or two. Almost four out of 10 mortgage-holders in deep arrears (more than two years past due) are not engaging with their lender on restructuring their loan, according to new data published by the Central Bank. The research found that while the overall level of loans in arrears is decreasing, for those deep in arrears the problem is worsening. The figures come as a number of banks have moved to bring down their level of non-performing loans by preparing to sell off entire loan portfolios, writes Ian Guider. The owners of more than 14,000 homes that are in long-term arrears in Ireland could lose their properties, according to the Central Bank. Some 28,046 private dwelling homes were in mortgage arrears as of last December and the Central Bank has said that more than half of those cases were “classified as involving the potential for loss of ownership outcomes”. Research from the Central Bank shows that 44% of mortgages or just over 13,000 in long-term arrears are now more than five years past their due date. That is up from 34% from a year previously. 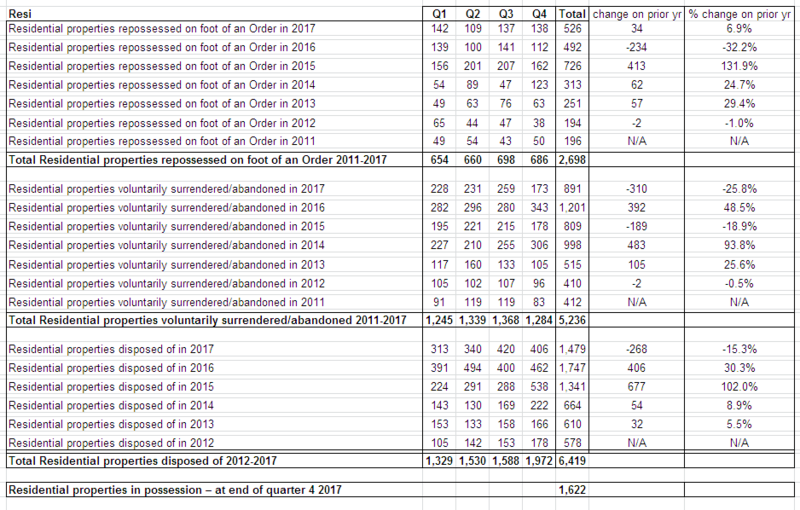 CB currently only publish 2 years+ in arrears in their quarterly release. I’ve argued this should be extended to 3+, 4+ and 5+. He’s over in RTE already…in the Sean O’Rourke studio and he’s managed to get ‘Tsunami’ into his opening salvo. Seamus Coffey said the CB report shows that the average default period of the 14,000 is 5 years. 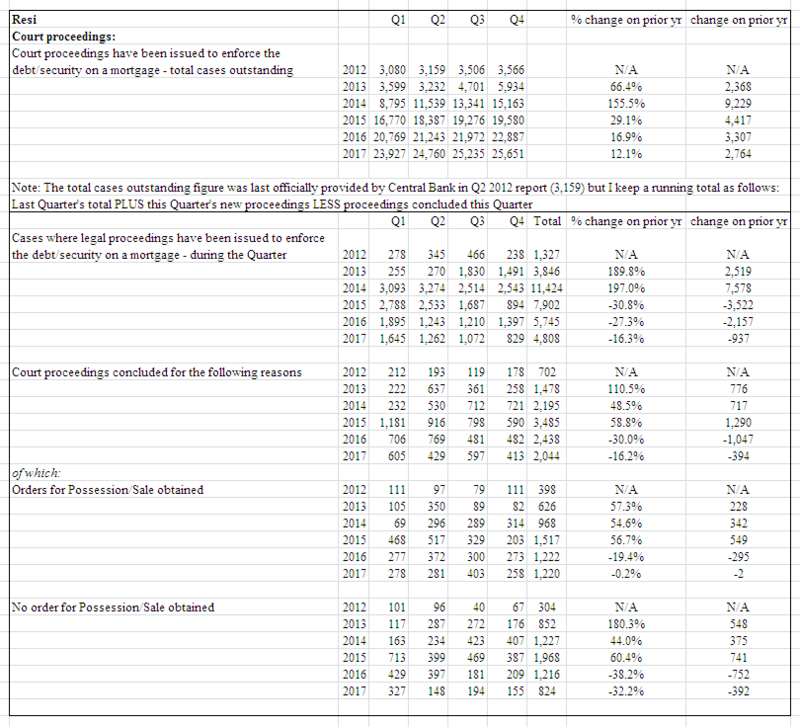 And these 14,000 in the report are only about 45% of the overall long term arrears out there. Coffey has just accused Hall of making up stuff over definitions of engagement Hall believes it to be getting a different person on the phone every time you ring the bank. Coffey points out that its actually around the # of missed mortgage payments. Hall has said 90% of the people he has dealt with still have their home, 10% lost out. As I understood it Coffey pointed out the condition to be satisfied is that the mortgage holder engages/communicates with the Bank. So that can be as simple as a phone call or two. Casino Hall then went on about Bank call centres having systems to rotate calls around. So the defaulter would get a different person dealing with their case each time they call. Oh the indignity. At least we got Coffey putting it up to Hall, rather then him getting a free run and advertising on RTE as he usually does. Thd ECB is pressurising the Dublin branch to be seen to get some movement on arrears, as it is an embarrassment to compare figures across Europe. The arrears industry is such, that nothing would even be raised on this issue if Dublin was left to it’s own devices.